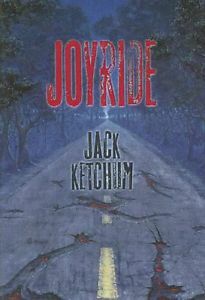 Joyride was the first time I entered into one of the worlds Jack Ketchum has created. Now that I have finished the novel, I am a huge fan. The novel is enjoyable, the characters interesting, and the ride on which Ketchum takes the reader is exciting. Joyride‘s plot is relatively simple, the narrative straightforward; however, that doesn’t mean that it is a typical, run-of-the-mill story. The novel stands out despite its simplicity. One of the reasons for this may be in the quality of Ketchum’s writing. He doesn’t provide superfluous material, but rather presents the reader with a snapshot of time in which the villain of the story finds the right time to begin doing what he has always dreamt of doing: killing those he feels deserve it. In a previous post, I discussed Batman: The Killing Joke and how it only took “one bad day,” as the Joker put it, to create a villain. The opposite is true in Joyride. For Wayne, the villain of Ketchum’s novel, already has the intense desire to kill at the start of the novel, and it only takes, in Wayne’s point of view, one good day to become a killer. That good day comes when he witnesses Carole and Lee kill Howard, Carole’s abusive ex-husband. He sees others do what he so desperately wants to do, and this prompts him to kill. But why does Wayne have this innate desire? Wayne has an incestuous relationship with his mother which is ongoing with no explanation as to when it began, and he has a notebook filled with names of people who he feels deserve to be hurt, who may have done something that he feels have wronged him–but nothing is explored too deeply. While this lack of exploration may bother some readers, I wasn’t bothered as I don’t feel the story needed to go too much into the backstory. The material Ketchum provided is enough to hint at some troubling psychological issues, but open enough to individual reader interpretations. An interesting parallel exists between Carole and Wayne. Carole was molested by her father as a child, but, like Wayne, the events aren’t explored. The difference between the two characters is that Wayne actively participates in the taboo relationship whereas Carole does not. Wayne may have welcomes it, which would indicate a tremendous amount of psychological trauma may have occurred during childhood when, I assume, the relationship began. Carole, however, considers it a nightmare. When it comes to killing, Wayne, as discussed, desires to kill people; Carole, on the other hand, does it only to escape from a man who is abusive and seems like he will end up killing her. She doesn’t enjoy killing and is further traumatized by the event. These two characters represent a yin and yang. Carole can be considered the white part of the concept, whereas Wayne is obviously the opposite, that is, the black part of the concept. However, they aren’t completely distinct as each share a part of the opposite, even if minute. Carole, primarily white, carries a smidgen of black as she proves capable of killing, or at least setting up the target. Wayne, primarily black, carries a smidgen of white. How so? In his mind, he thinks some of what he does is out of good. His notebook of targets is filled people he believes are wrong. Moreover, he doesn’t initially try to kill Carole or Lee because he believes they are like him, and he wants to be their friend. Overall, Joyride is a fun read. Some readers may not like the lack of depths in particular areas of the narrative, but I am not one of those people. The characters are interesting and the plot is fast-paced. This is one novel I recommend. One of the things I also liked most about it this story was the fast pace. This story is called Joyride. It should feel like exiting a roller coaster when you’re done, and it does. Have you ever read Intensity by Dean Koontz? It’s one of my favorite stories. It does go into depth more than this one, but has a fast pace, too. I admit, I liked this book more than I thought I would. Just from the title and first few pages I thought, “Oh geez, The Sculptor all over again” from just the way it jumped right in to the bad guy’s head and revealed all of his bad thoughts. But I think Ketchum did a nice job of how, like you said, making the novel a quick, shallow read. But some of the kind of cursory backstories he gives are pretty illuminating. Not just for the characters but of just people too. Nice use of the yin and yang. Carole and Wayne both come from abusive backgrounds, but whereas Wayne embraced and ran with the crazy, Carole just tried to survive it. She can kill, but only out of desperation. I also like the yin and yang parallels you’re drawing, but if you look at it from a character perspective then they would reverse, yes? Carole thinks she’s the monster while Wayne is the superhero of his own story. This would be a fun concept to explore! Which is worse? Honest evil or delusional evil?